At dawn, having finished their baking, these men relax with a cup of tea. They sleep in the bakery, make bread early in the morning, and sell it by day. 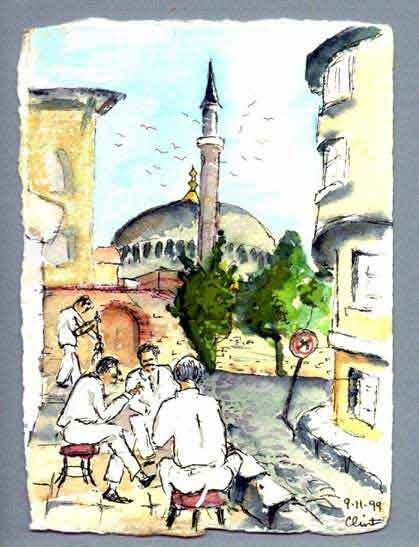 The minarets of Aya Sofya spear skyward, pigeons swirling in the morning light. Breakfast at our hotel will be standard in Turkey, with olives, tomatoes, cucumbers, cheeses, an egg, coffee and bread from this small bakery. We stay at the quaint, small Hotel Empress Zoe, $75 dbl. Next door is the Four Seasons $250 dbl. Around the corner is the clean Yucelt Interyouth Hostel, $20 dbl including two meals and free drinks. All of these are centrally located near the most interesting tourist sites. The Zoe is a renovated Roman bathhouse, the Four Seasons was a Turkish Prison, and the Youth Hostel a converted family residence.